I had never really seen nor read anything against evolution and was intrigued to see what argument there could be against what seems to be a solid theory. 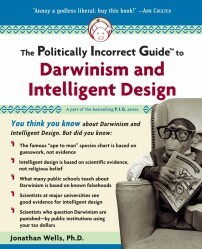 The Politically Incorrect Guide to Darwinism and Intelligent Design by Jonathan Wells Ph. D. opened my eyes a couple of ways. The first was the term evolution. Most people – myself included – think of evolution and Darwinism as the same thing. Wells makes a clear distinction between the two. The idea is that evolution is a good, sound theory but when it goes from adaptations to improve survivability to entire species changing into other species, that is termed Darwinism. There, is the distinction. Darwinists have co-opted the term evolution to explain what is actually a completely unproven and frankly, unlikely thing – that a fish becomes a mammal – a reptile becomes a bird – an ape becomes a man. There is actually no evidence of this in the fossil record… it is all just speculation. I did however, like that someone is willing to challenge scientifically based agendas with scientific fact.